Chronic neck pain without a disc protrusion or facet indications (negative blocks) gets no respect. One can have pain from internal disc disruptions in a neck disc and have nothing to show for it. Now it looks like the patient’s pain can be cut in half for months with just injections of local, epidurally. randomized, double-blind, active control trial. Suddenly I see problems – if something is non-particulate it means its duration of action is maybe 4 hours which is not likely to do anything. I once had a patient who was injected with soluble decadron for a tennis elbow – needless to say, it helped his elbow squat. 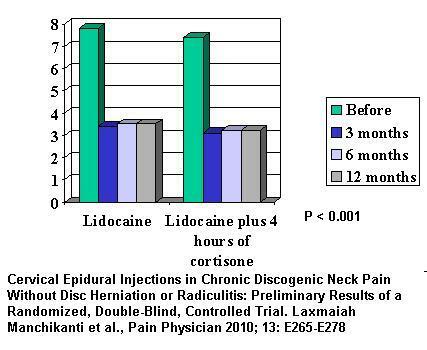 However, using a cortisone injection that lasts only 4 hours is, as far as I am concerned, the same as not using any cortisone at all – and should show no difference in effectiveness – which is what it showed! Comments – I heard of a man in his forties with teenage children who went to Vancouver for special neck imaging. After, they told him there was nothing that could be done for his pain. He went back home and killed himself. This story makes me sick considering how much this simple measure (and maybe more so if they added real cortisone) could help. Never give up – there are always new things coming out. This entry was posted in Neck. Bookmark the permalink.